Years ago we covered using thermite to destroy a hard drive. The idea is that if you melt through the platters, the data is completely unrecoverable. There are tons of videos of people doing this, but they all have a similar format. There’s a hard drive, with a flower pot or soda can sitting on top full of thermite. They then light this with a strip of magnesium and a torch. I wanted to do something a little different. I wanted to implement thermite as a self destruct mechanism inside the device. To do this, I had to come up with a way to ignite the thermite. This stuff is very difficult to light. You have to get it really really hot. The easiest way is to use magnesium, which itself isn’t the easiest thing to light. What I finally landed on was an ignition system that uses model rocket igniters, gun powder, and magnesium to light the thermite. The model rocket igniter can be set off from the 12v line inside your computer. However, it isn’t hot enough to light magnesium shavings, much less thermite. To get it to work, I needed to add some gunpowder. A small amount of gun powder would get hot enough to light the magnesium shavings, which in turn were hot enough to light the thermite. I had to be careful though, because too much gunpowder would cause a rapid expansion, blowing the thermite everywhere instead of lighting it. 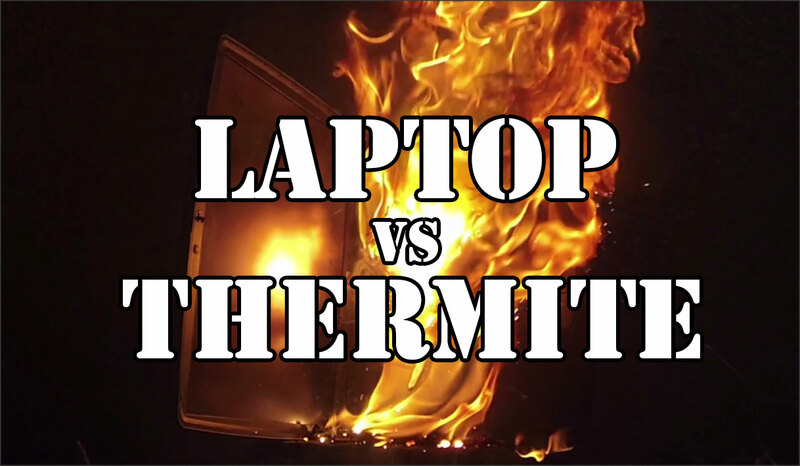 You can actually see some red thermite being blown out of the external hard drive and the laptop as the gunpowder ignites. I wasn’t sure about this one. There isn’t a whole lot of space for thermite and the ignition system inside the box. On top of that, the only space was at the side of the hard drive, where the walls are the thickest. I had no idea if the small amount of thermite I used would penetrate the drive. It did, just barely as you can see in these pictures. It looks as if it pooled in the screw holes and made it inside. The platters are damaged. I decided to completely replace the cd rom with thermite. This gave me a ton of space to put things. I was pretty positive this would work. The hard drive is in the center of this laptop, which meant I had to place it on its side for this to be effective. You can see the thermite work its way down toward the drive in the video. As you can see in the pictures below, the drive cover is completely gone and the platters are destroyed. Success! For those in the states, Happy Thanksgiving. Whether or not you celebrate the traditional holiday, you might still want to take a moment to think of what you are thankful for. We are thankful for our readers, who drive us to keep posting projects and challenge us to improve our skills. The Hackers, who supply us projects to write about, both simple and complicated. We are thankful for our bosses, who employ us to do this awesome stuff and only beat us occasionally. And we are thankful for thermite, which burns oh so bright and looks oh so pretty. 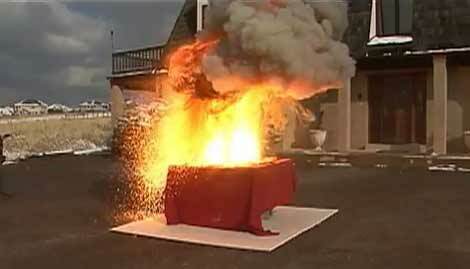 Join us after the break to see a turkey, roasted with thermite in slow motion. [Wolf] emailed us to show us his Self destructing Hard Drive tutorial. He’s using thermite, like we did, but he’s put a little more effort into the delivery system. In the video, you can see a huge spray molten iron. This is because his “jet”, the block of wood hollowed out to focus the thermite on to the hard drive didn’t hold a seal at the top. Not too bad for try #1. He could probably build this to be more contained, but even then it will most likely turn into “entire self destructing office” if it were to actually be used. A little common sense goes a long way here folks, this is molten metal and is extremely hot and dangerous. 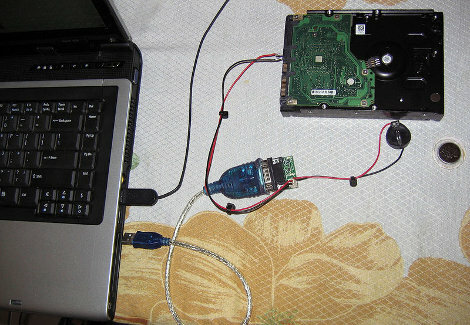 One of the worst moments almost every hacker has experienced is a hard drive inexplicably dieing. And of course, its at the most inopportune time and you’ve had no chance to backup! Recently there has been an influx of Seagate hard drives (specifically the 2700.11s) kicking the bucket with firmware errors 0LBA and BSY. The good news is [Gradius2] has made guides to unbrick your drive without having to match serials. The procedure is lengthy, complicated, can easily become expensive, and there is the possibility of losing your data so it’s not recommended if you’re only getting those pictures of Mr.Fluffykins back. In such a case, Thermite might be a bit better solution. 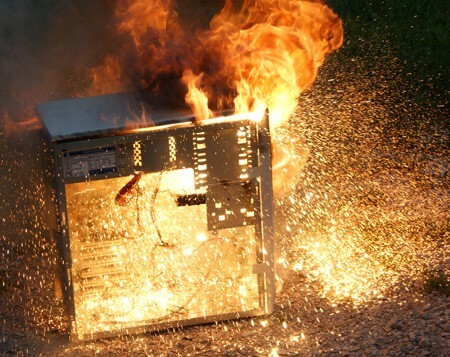 After we posted the “High explosives pc case” earlier we saw a resounding outcry in the comments for combustible destruction. Oddly enough, we got a submission of something along just those lines. [tazzik] has taken the heat sink off of his athlon 1400+ and covered the poor processor in potassium chlorate. As you can see in the video, this was not a very effective heat management decision. It is definitely fun, but nowhere near as explosive as our thermite shenanigans. After the overwhelming response to the Hackit we posted about automated hard drive destruction last fall, we finally decided to test out some thermite hard drive destruction ourselves. This has been done on The Screen Savers but they did not show up close results of the platters. So, aluminum and black iron oxide were procured through eBay, and until it arrived we watched some YouTube videos that showed a lot of fire and no real results. We decided to see what it would take to completely obliterate a drive. With the amount of personal data stored on your computer, we all understand the importance of destroying the data that is stored on the platters of a hard drive before disposing of it. There are many ways to destroy a hard drive; software, physical disassembly, drills, hammers, magnets/electromagnets, and acid, but none are quite as outrageous and dangerous as thermite. That’s what we’re going to do here today. Follow along for pictures and videos of the results.